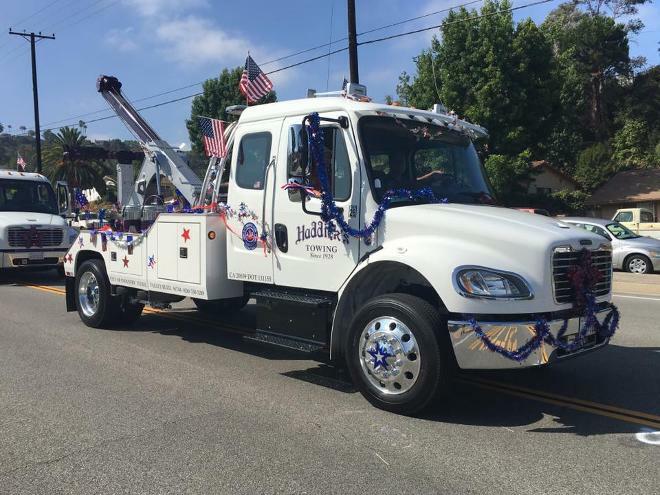 Haddick’s Towing Inc. has proudly been serving Southern California for over 88 years and have been one of the leaders in the towing industry in Southern California. We command a fleet of over 20 trucks capable of towing light, medium, and heavy duty vehicles. We also have light duty flat beds and a 36 foot heavy duty Landoll for heavy equipment, machinery, tractors, forklifts, and busses. Our main facility in City of Industry is located in eastern Los Angeles County and is centrally located to provide quality service to Orange, Riverside, and San Bernardino Counties. Our main Tow facility is over 10 acres and is capable of storing over 500 vehicles. Roy Haddick established Haddick's in 1928. Mr. Haddick business was located in downtown La Puente and served the CHP exclusively from the city El Monte to the city of Colton. In 1962 at the age of 23 with his wife and 3 young children Howard Welch decided to go into business for himself and purchased Haddick's towing from Roy Haddick. From its small start as a gas station and one tow truck nick named "Geronimo" Howard took over the business with great ambition to grow the business. After moving to a couple of different locations in the county Howard had grown the business enough to expand his vision and build a state of the art facility. So at the age of 30 he purchased the property on Valley Blvd in Current day City of Industry and developed a 7 acre towing and body shop facility. Howard continued serving local police agencies such as the Los Angeles County Sheriff’s Department and the California Highway Patrol and expanded the business to commercial and heavy duty towing and expanding operations facilities in Walnut, La Habra, Whittier, Buena Park and an auction yard in Industry. He was also one of the founders of the California Tow Truck Association (CTTA) which all major tow companies belong. Mr. Welch’s daughters Bonnie and Laurie continued in their father's footsteps in keeping the high level of professionalism and leaders in the industry, they are members of the Woman’s Business Enterprises (WBE). Today Haddick’s is in its 3rd generation of family operation and has expanded the business providing road service to AAA, Tesla, Allstate, Geico, and Agero. All Haddick’s technicians are trained, background checked, and certified through AAA, CTTA, and CHP. Haddick’s provides 24/7 live dispatch and services to companies such as Southern California Edison, UPS, Sysco and many local law enforcement agencies.